Here is the post about the 1995 Lincoln Mark VIII Electronic - Air Suspension Wiring Schematic. For those who had wiring problem on their 1995 Lincoln Mark VIII Electronic - Air Suspension Wiring Schematic , please read this post thoroughly so you can get the points on how to overcome the wiring problems on your 1995 Lincoln Mark VIII. 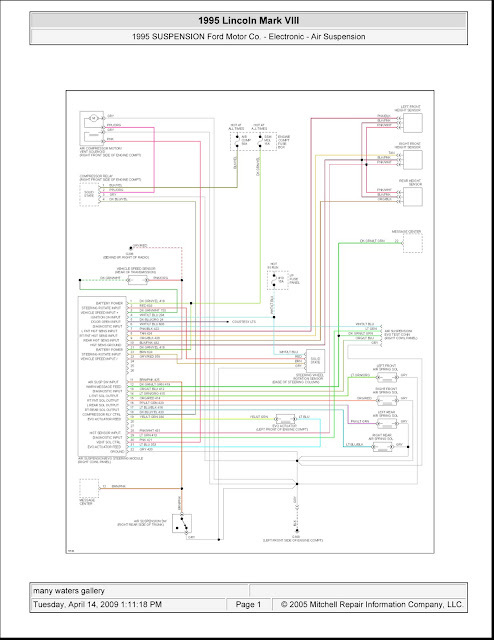 The first step is to understand the parts you can see in this schematic wiring diagrams. They are namely: air compressor motor/vent solenoid, engine compartment fuse ox, left front height sensor, right front height sensor, rear height sensor, compressor relay, message center, i/p fuse panel, vehicle speed sensor, battery power, steering rotate input, vehicle speed input, ignition on input, door open input, diagnostic input, left front height sensor input, right front height sensor input, rear height sensor input, height sensor ground, coutesy lights, steering wheel rotaton sensor, left front air spring solenoid, right front air spring solenoid, left rear air spring solenoid, right rear air spring solenoid, evo actuator, air suspention, evolution steering module, air suspension switch. The second step is to understand the color codes. It is written in the schematic wiring diagrams. It functions to determine each wire, so that you are easy to differentiate them. Well, by doing the both steps you are now be able to continue to work on the 1995 Lincoln Mark VIII Electronic - Air Suspension Wiring Schematic. 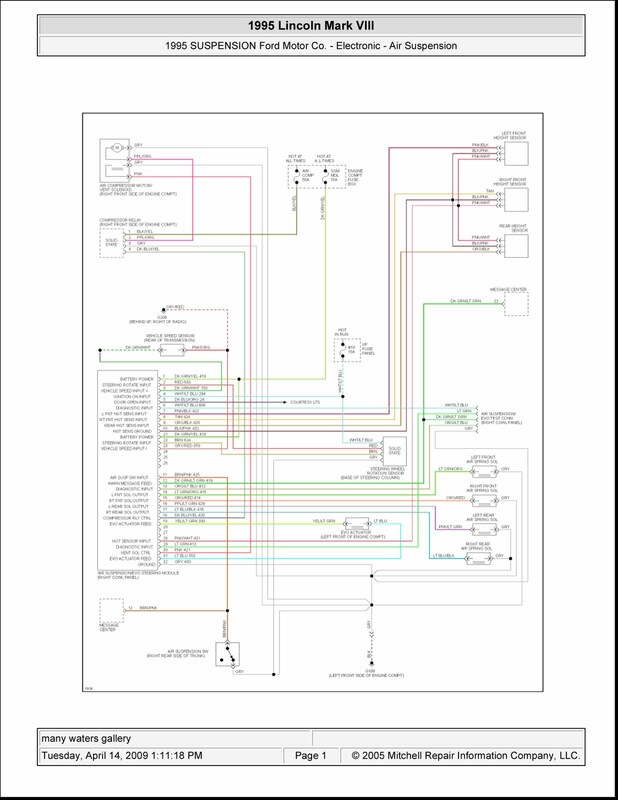 And here is the clear and readable image for the 1995 Lincoln Mark VIII Electronic - Air Suspension Wiring Schematic. click on the image to enlarge or you can use the picasa photo viewer to get the best view.